Voodoo Tactical Standard 3 Way Deployment | BUDK.com - Knives & Swords At The Lowest Prices! 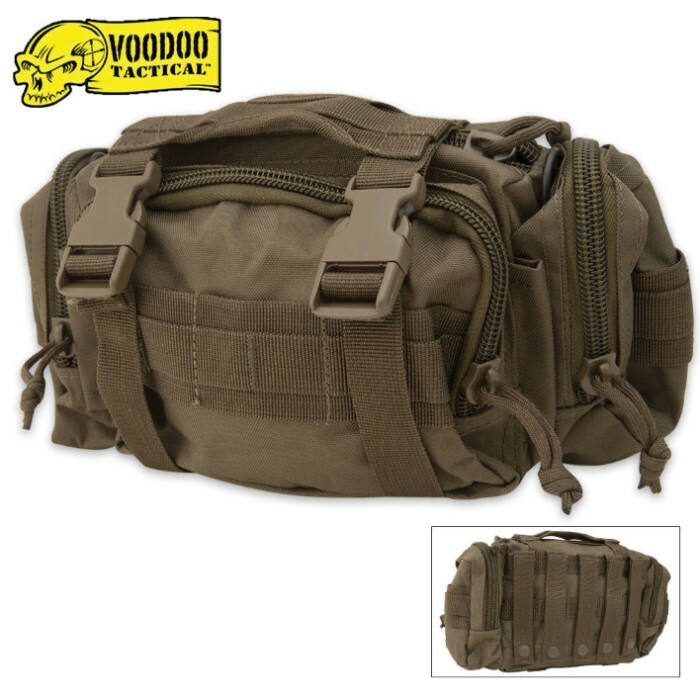 You'll feel and look like a soldier ready for deployment with this Standard 3 Way Deployment Bag. This military-grade deployment bag features a web carry handle, rear universal attachment straps, removable and adjustable nylon shoulder strap, heavy-duty military self-repairing zippers, 2 side zipper accessory pouches, a main zipper divided compartment, front zipper divided compartment, 2 pen holders, side-release buckles, adjustable compression straps, and lots of webbed attachment points. Measures 11 1/2" L x 5 1/2" W x 6" T.